Wit Stwosz Hotel is located in a historical building at 28, Mikołajska Street, in the heart of Kraków, city with rich history and interesting culture, full of unique monuments and must-see places, inscribed on UNESCO’s World Heritage List. 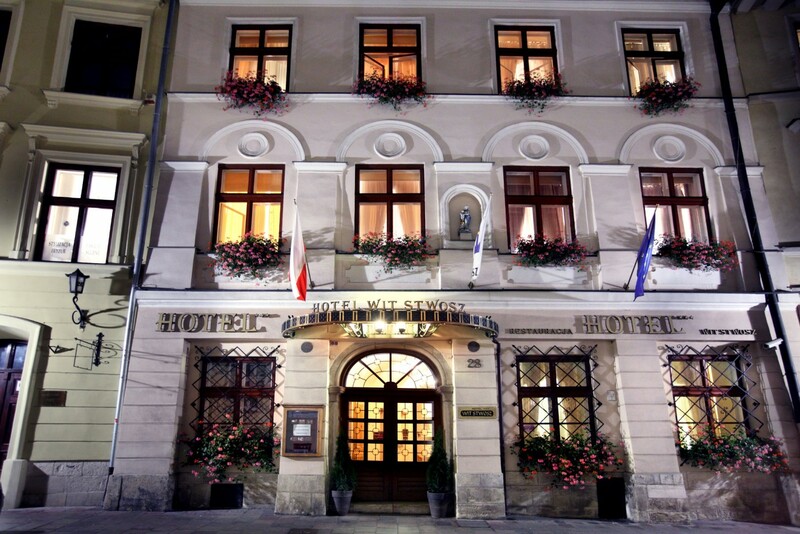 The origins of the building, in which from 1998 you can find Wit Stwosz Hotel, can be traced back to the end of 14th century. In that time, the building was one-story only, but it already had brick cellars. First major reconstruction of the house took place in the 15th/16th century - the new, single-story, but now entirely brick building, was built on the foundations of the older one. The stone entrance portal to the building is preserved from that period, alongside with the barrel vaulted ceiling and the gothic portal in the cellar. The successive owners of the building took care of the development of the building as well as the courtyard area. In the courtyard there was a well, and in the depths of the plot, some farm buildings, including a brewery and a malting plant. Another owner transformed the mentioned brewery into a butcher's place. Over the next century, the building was passed on from one owner to another. Unfortunately, over the years its condition deteriorated further, until the first half of the 19th century, when the property was purchased by Mr. Gawinowski, who in 1827 began its thorough renovation and extension, which gave the building its present appearance. The front facade received a classicist design, which we can still admire, with a figure of Madonna with Child in the central pilaster. Until today, it is also possible to see the 19th century sail vaults in rooms on the ground floor and magnificent polychromes discovered during the renovation of the building in 1985 on the walls and ceiling in the apartment on the first floor. In December 1902 the property became the part of the Roman Catholic Church Fund, under the name of "The house of the poor serving the church of the Blessed Virgin Mary in Krakow", that is, actually St. Mary's Basilica. The administration of the building performed its minor modernization, reconstruction and some repairs. After the II World War, in a new communist reality, the house at 28, Mikołajska Street still remained the property of St. Mary's Basilica, but it was inhabited by numerous lodgers, who over the years contributed to its devastation. In October 1984, the property along with other nearby buildings was taken over to the State Treasury, as the authorities ordered their reconstruction to the new headquarters of the PZPR Committee in Krakow. In 1989, the political system in Poland changed, the communist party was dissolved so the new seat was no longer needed. However, the renovation works started before were not finished and in 1990 the building became the property of the local community. At the same time St. Mary's Basilica got the opportunity of regaining the property, and after a few years of proceedings, in July 1995 the house at 28, Mikołajska Street was officially the property of St. Mary's Basilica once again. In 1998, the final renovation works began. On August 15th, 1998 Wit Stwosz Hotel started his own history in this amazing building, and it has been continuously hosting tourists here for over 20 years.